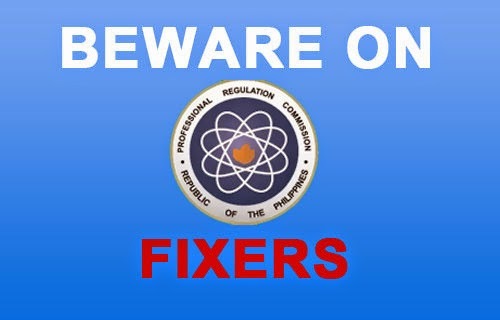 The Professional Regulation Commission releases new warning to the public specially to the applicants, prospective takers of various licensure examinations including registered professionals and members of their families against fixers out to prey on unsuspecting victims. The modus operandi of these fixers is to pose or introduce themselves as PRC officials or employees and to assure the examinee or members of their families that they can guarantee the examinee to pass the board examination or facilitate the validation of licenses in exchange for a certain amount of money, according to PRC. In addition to this, meetings with the examinees or their families where the money is to be paid to the fixers are then conducted in a restaurant or other place outside of PRC premises. The new style of these fixers was the use of the social networking site. Just recently, numerous e-mails from various professionals which sought to confirm the identity of a PRC official thru the social networking site “Facebook” were reported to the Commission. The commission agency reiterates that it does not maintain an account on any social networking site. Other than the PRC mobile services (PRC on-wheels) and the PRC I.D. Renewal Center at the Malls, the Commission stressed that official transactions are done at all PRC Offices (Central, Regional and Satellite) and with authorized PRC personnel ONLY. To verify the identity of a PRC official whose name may have been used by these fixers, the public is advised to check from the directory of PRC officials posted in the PRC portal site: www.prc.gov.ph. PRC said that in waging war against fixers, syndicates and fake professionals, it continuously coordinating with other government agencies for a more coordinated effort to combat their fraudulent activities. It also asking PRC clients and the general public to help in this effort by reporting questionable transactions to the Commission. For inquiry, assistance or any information regarding suspicious individuals and transactions, the public is encouraged to call the PRC’s Hotline: (02)310-0026 or e-mail their reports to prcpimru@gmail.com. Comments or suggestions about "PRC release new warning against fixers" is important to us, you may share it by using the comment box below.